This summer went pretty well. In fact, it went amazingly well compared to what we were expecting. It was a summer of love, as Jude and Tommy found a way to get along. For six whole weeks, they spent nearly every day together, and I even thought there were glimpses of a friendship developing. If not a friendship, then at least a huge increase in their level of tolerance for each other. The last 2 weeks, however, have seen that progress fall apart, and the 2 of them sharing the same space at the same time is as difficult as ever, maybe even worse. Autism can seriously affect a person’s ability to communicate and interact with others. So 2 young brothers, who currently reside somewhere along the severe end of the autism spectrum, were always going to have some challenges becoming friends. Right now Jude can not bear to share the same space as Tommy, he’s constantly anxious and angry around him. Tommy, on the other hand, is oblivious to Jude’s feelings. He isn’t purposely trying to annoy his brother, he just doesn’t understand and is busy being Tommy! Four years ago, when Tommy first came along, we wondered what Jude would think of him. What effect would this new-born baby have on Jude’s life? Jude was 3 years old when Tommy arrived and showed no comprehension of the events that had just taken place. I think as far as Jude was concerned one day he was taken to a strange place (hospital), made to take an interest and pose for pictures with this really small doll-like person, and then mummy and daddy brought him home with us. When he woke up the next day he was still there, and the next day, and the next day after that. Suddenly there was someone else living in our house…..
Jude would look at Tommy now and again and laugh, but most of the time he tried to stay away from him. This new person made a lot of noise, and that’s one thing that Jude really couldn’t handle. The first time Jude showed any real emotion about Tommy’s presence was when he came to lay on my lap one day when I was giving Tommy a bottle. This happened a few times as he tried to get himself between Tommy and me. I thought this was amazing, a real breakthrough. Jude was showing emotions and displaying a sense of understanding that he’d never shown before; that we never knew he was capable of. Over the next few months, apart from when Tommy was crying, Jude seemed quite happy to be in Tommy’s company. As Tommy grew he began to take an interest in his older brother, who was never still for a second. Often Tommy would strain himself to catch a glimpse of what Jude was up to, and laugh as he ran past, or was bouncing up and down. Sometimes Jude appeared to be aware and played to his audience. Once Tommy became mobile, things quickly began to change. It was no longer as easy for Jude to escape if Tommy was pushing his senses to the limit. Tommy was now able to follow him, meaning the noise followed Jude too. This was the beginning of a huge shift in how they behaved around each other. As they got older, and Jude struggled more and more with some of his sensory challenges, Tommy turned into everything Jude hated about the world. By the time Tommy was 18 months old he was loud, unpredictable, and paid no attention to what Jude needed. Jude would constantly retreat to get away from him, and once he began to self-harm, the noise that Tommy made would often be the trigger. One of Tommy’s challenges with his autism is also an overwhelming need for things to be a certain way, to have a certain order. If Jude is doing something that might interfere with that order Tommy has no problem in letting him know. When Jude watches tv he is often right up in front of the screen, tapping away at it. The lights and the colours, and the sensory stimulation it provides makes him feel like he has to do it. It’s also something he really enjoys. If Tommy is trying to watch at the same time he has no qualms about grabbing his brother by the arm and dragging him away from the screen. Whenever this happens Jude always looks at him in shock. It’s as if he can’t quite process what just taken place. Never once has he reacted to Tommy and shoved him back, always preferring to retreat back to the sofa, or leave the room altogether. Apart from in the midst of a meltdown, Jude is s a gentle soul, and you can see how uncomfortable he gets whenever Tommy makes any attempt to touch him. Yet, over the summer, there were signs that this was improving. No more so than when they were able to share a paddling pool together, on many occasions. If Jude tried to leave the pool Tommy would often try to drag him back in, wanting his brother in there with him. Jude allowed him to do so, and there were hours of them playing in the same space. They spent much more time together, had trips to the park together, even managed to watch tv together. It was never perfect. There were still plenty of times that Tommy’s screams and general loudness were all too much for Jude, but a few minutes later it would be forgotten and we could start again. The holidays proved to be much easier than I had ever imagined, and I really could see their relationship slowly start to improve. But that was the summer. It’s now autumn, and all of that has been forgotten. Over the last 2 or 3 weeks, Jude’s attitude towards Tommy has taken a marked turn for the worse. If Tommy enters the room that Jude is in his anxiety spikes off the charts immediately. With a flick of the hand towards Tommy, Jude constantly gestures that he wants him removed. If he isn’t, the tantrum/meltdown begins. Even if Tommy is in the next room being loud, Jude is on edge, frantically trying to communicate to us that we need to make him stop. It feels like it has reached a point now where he literally does not want to be in the same house as him, let alone the same room. If Tommy is making a lot of noise downstairs Jude can still hear him, and even this makes him upset. On Saturday morning Jude woke up at 10 am, but didn’t get out of bed until 12:30. He preferred to stay in the sanctity of his bedroom, rather than run the risk of mixing with Tommy downstairs. Then, last week, Jude reacted towards Tommy for the first time. He struck him on the top of the head, twice. It wasn’t particularly hard, nowhere near as hard as he hits himself, but the intent to demonstrate to him that he didn’t want him around was clear. Tommy used his normal defence mechanism, and screamed back at him, possibly the worst result for Jude. Hopefully, it will help him realise that hitting Tommy is not the way forward! What’s changed to make Jude be even more uncomfortable around his brother than ever before? The only thing I can put it down to is his return to school. He has been more difficult at home since then, having much more of short fuse than the last few months. 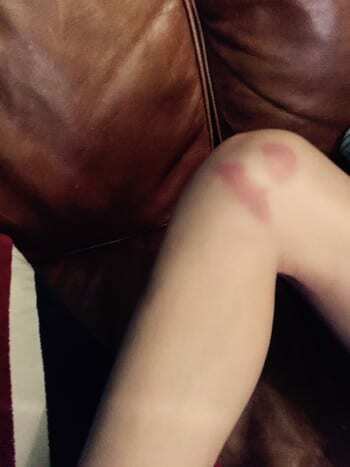 His legs had healed nicely over the summer, but within 2 days of starting school again the bruises have reappeared, a stark visual reminder of the number of times he drops to his knees during the day. The reports coming back from school are generally good, and that he seems to be doing better than last term. But sometimes, the anxiety and subsequent meltdowns can have a delayed effect.Whilst he might be keeping it together at school, he’s working extremely hard to do so. By the time he reaches home it’s become too much for him, so he feels the need to release all of that pressure and anxiety. Maybe he associates Tommy with the stresses, sounds, and unpredictability of his fellow classmates, and can’t’ bear to deal with it at home too? We’re back to trying to find the right balance of making sure both boys are happy, without isolating them from each other 24/7. We need to find a way to help Jude to understand that Tommy isn’t going anywhere and that he’s going to be living with him for a long time. We also need to help Tommy find a way to control his emotions too, and not be screaming all the time, a habit that has increased recently as well. So many times on our journey, just when we think we’re making progress it suddenly seems to be the complete opposite. It’s like we’ve taken one step forward and two steps back, time and time again. It can be frustrating. It can be annoying. Some days it can be soul-destroying. In the past, it’s something I’ve really struggled with, the constants knockbacks just when you think things are improving. This journey has never once seen us travel in a straight line. More often than not we’re going round and round in circles, just trying to find the right way. The destinations we’ve passed along the way looked nothing like we thought they would. The place we want to get to can seem further and further away. Yet somehow we have to find a way to accept that. Find a way to get back up, let go of those feelings and try again, only this time with even more commitment, even more passion than the last. We just have to have faith that in doing the best we can we will find the right way. That we’ll reach a place that will make their lives better. Right now our summer of love is officially over. Let’s just hope we’re not heading towards the winter of discontent!